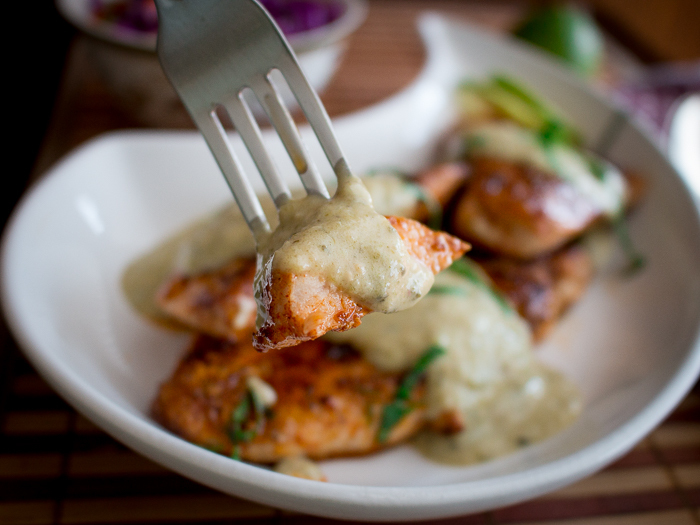 Wow, just the title is a mouth full....Tomatillo Key Lime Chicken Sizzle but it is so delicious. 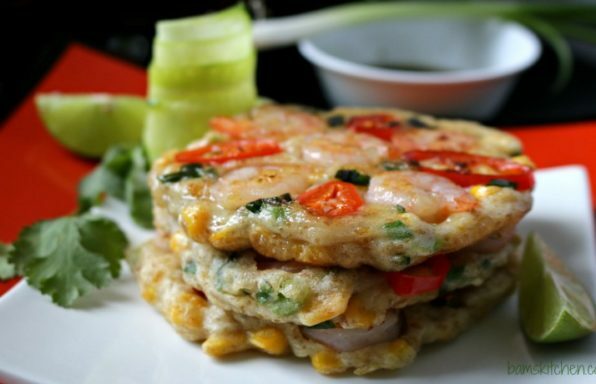 HWC Magazine first posted this recipe back in 2012 but was in a much needed update to the recipe instructions as we have simplified this process to get this meal down to a 30 minute meal. This bite is for you! 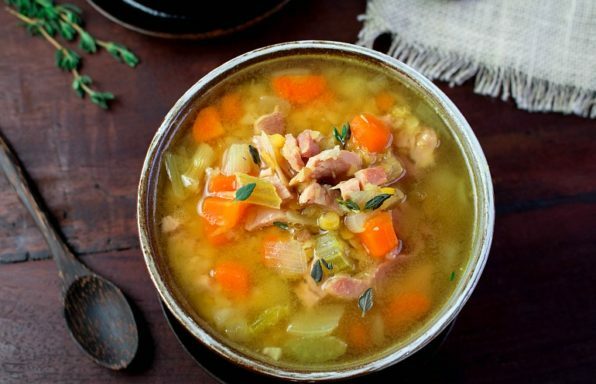 We know the holidays are around the corner but what are you going to make for dinner the other 364 days of the year??? Tomatillo Key Lime Chicken Sizzle is a delicious recipe to rock out on Taco Tuesdays, parties, gatherings or just an easy nutritious week day meal. We served our meal with a quick and easy chopped cabbage, carrot and onion coleslaw with a cumin spiced vinaigrette. Tomatillo Key Lime Chicken Sizzle is a delicious low carb, gluten-free and cardiac friendly meal. Dairy free options available in the recipe instructions below. 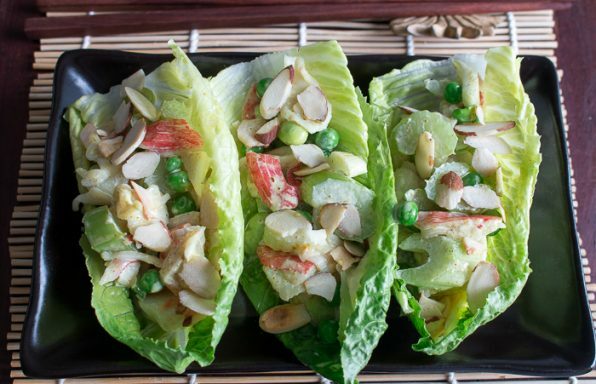 Have you ever used tomatillos in a recipe? 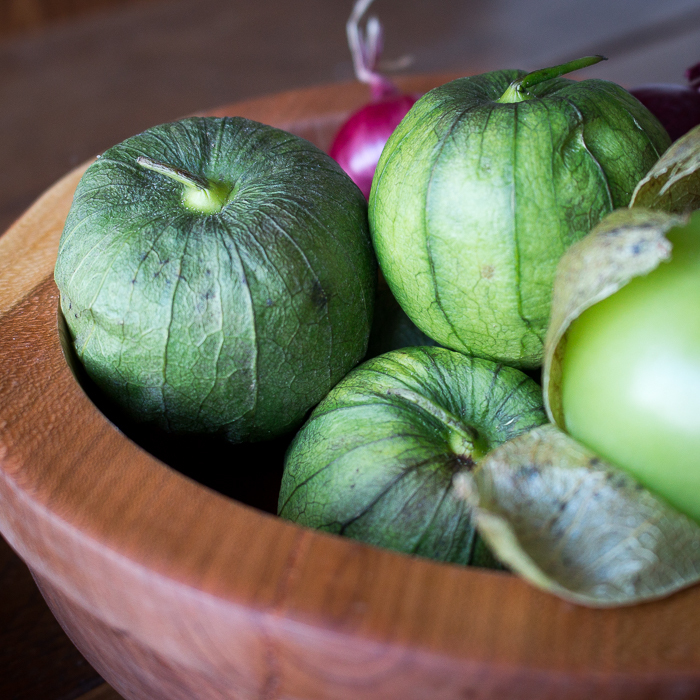 Tomatillos, if you are not familiar with them are Mexican husk tomato (or sometimes also called a jam berry) and have a tart, fruity, and slightly herbal flavor when roasted. 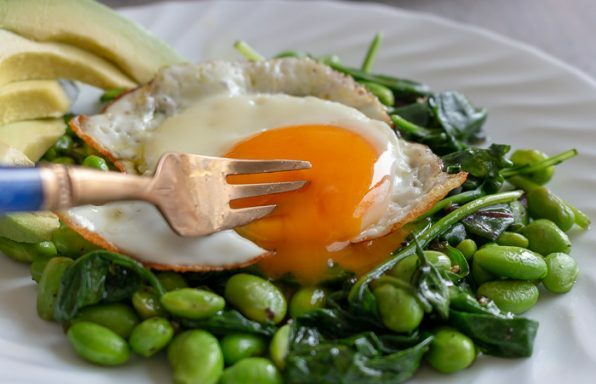 If eaten raw they are more acidic in flavor. Tomatillos are not green tomatoes. They actually come from a different nightshade plant and are covered with a paper husk. 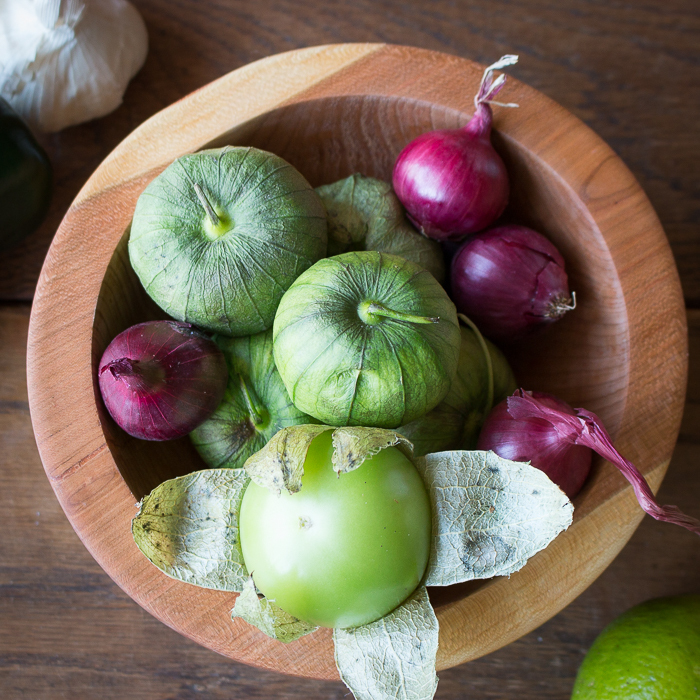 If you cannot find tomatillos at the market, you can substitute green tomatoes but it may be more tart and need additional seasonings. The roasted tomatillo salsa has a lot of action packed flavors going on, almost like a little party in your mouth. 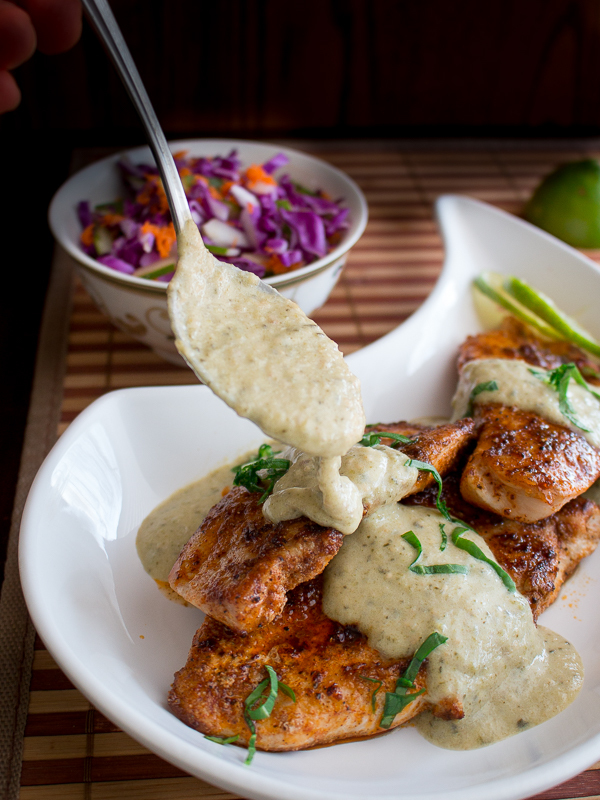 Chicken can be BORING but that is where sauces come to the rescue to brighten this ordinary protein and take it to the next level. Our 3 minute Vegan Sun Dried Tomato Pesto rocks drizzled over grilled chicken breasts too. 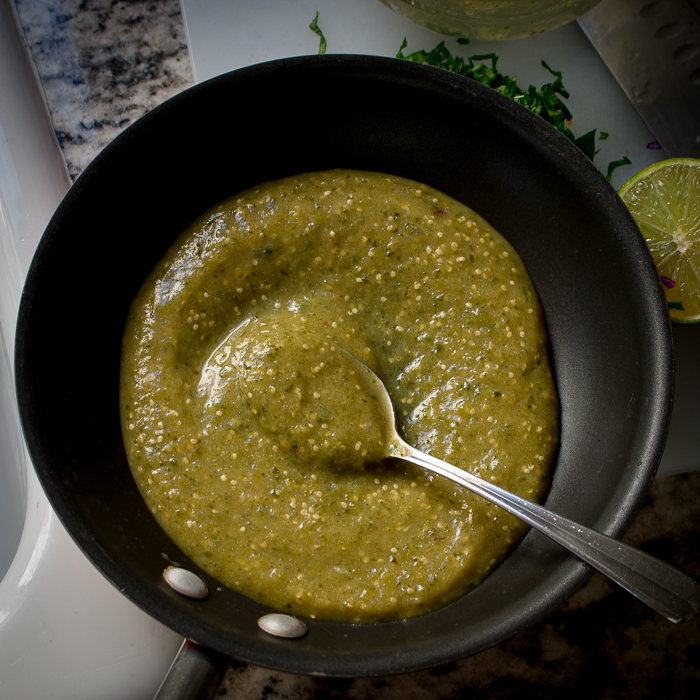 Roasted Tomatillo and Key Lime Cilantro Green Chili Sauce is the perfect accompaniment to anything grilled. 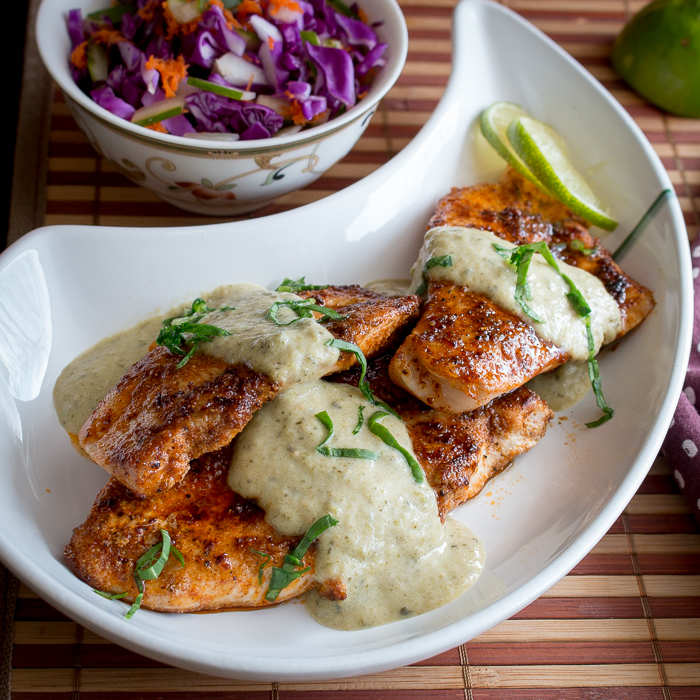 Grilled Chicken, Grilled fish, grilled tofu and any grilled vegetables just rock with a little of this zesty and creamy sauce. 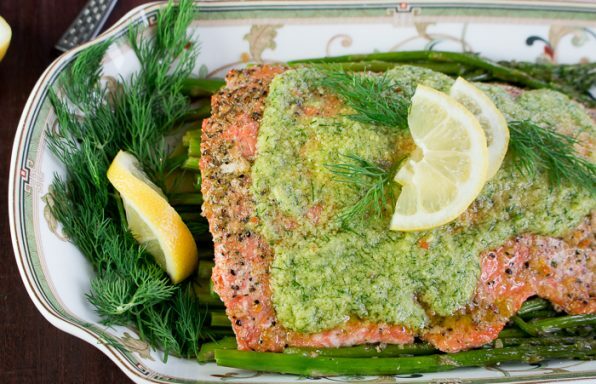 However the best part of this dish is that it is the perfect weeknight quick and easy dish that you can make in the winter in a grill pan or in good weather on the outside grill. 2Remove husks from the tomatillos and wash well. 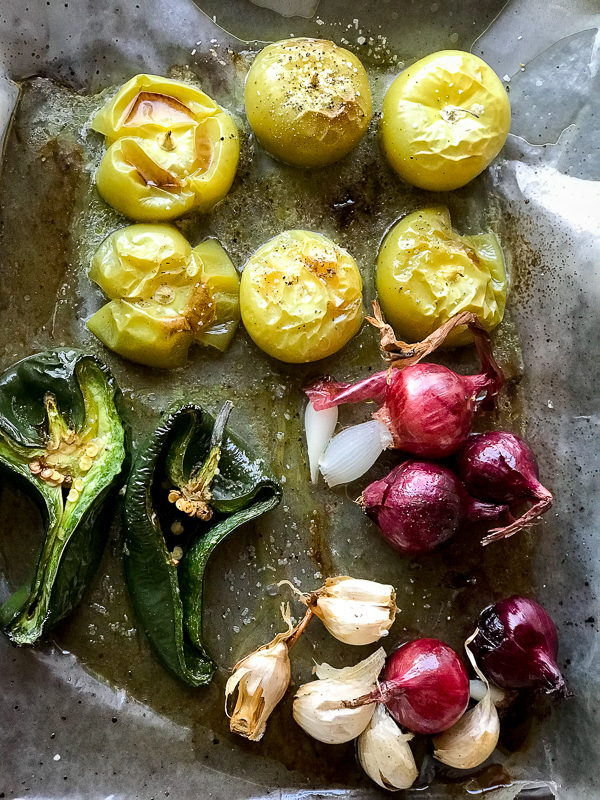 3On a parchment (wax) paper lined baking sheet put the chiles, garlic, onion and tomatillos. 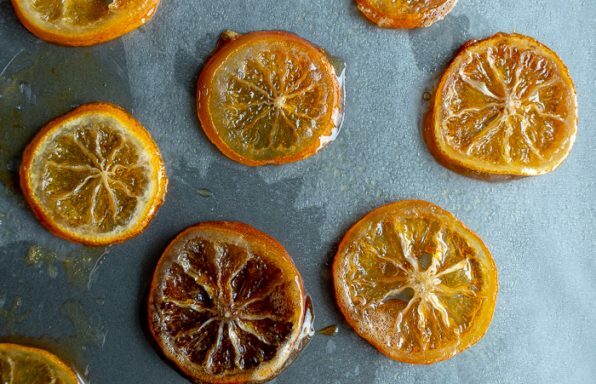 Season with a little olive oil, and salt and pepper, to taste. 4Put on vegetables a rack about 1 or 2 inches from the heat, and cook, turning the vegetables once, until softened and slightly charred, about 5 to 7 minutes. Keep a close eye on them so they do not burn. 5When cool enough to handle, squeeze the garlic pulp from the roasted garlic into your food processor and discard the skin of the garlics, and pull off the tops of the chiles, remove the seeds and peel peppers and place in the food processor, discard the skin. Squeeze the the tops of delicious roasted tomatillos and allow the internal tomatillo pulp to go into the food processor but discard the skin. Add all the broiled ingredients(tomatillos, Serrano chili, garlic and onion) to a blender along with the fresh cilantro, lime salt and pepper to taste and a bit of olive oil and puree. 6Put the Roasted Tomatillo and Key Lime Cilantro Salsa aside. At this point you can put in refrigerator for later use, can the salsa or freeze it once it cools down. 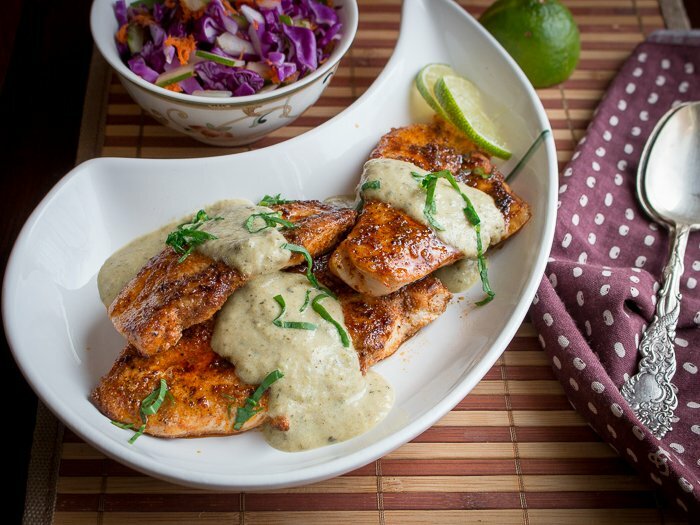 7Marinate chicken breasts with olive oil, fresh garlic, salt, pepper, paprika and a little lime zest and set in the refrigerator for at least 30 minutes up to 24 hours to marinade. 8Grill chicken breasts over medium heat for about 4-5 minutes each side or until the juices run clear. (depends on how thick your chicken breasts are) We like to cut our chicken breasts lengthwise so they are thinner and cook quicker. 9Put the Roasted Tomatillo and Key Lime Cilantro Salsa in a small sauce pan on low heat and add 2 hearty teaspoons of butter and drizzle in about 3/4 cup of soy cream and salt and pepper to taste. 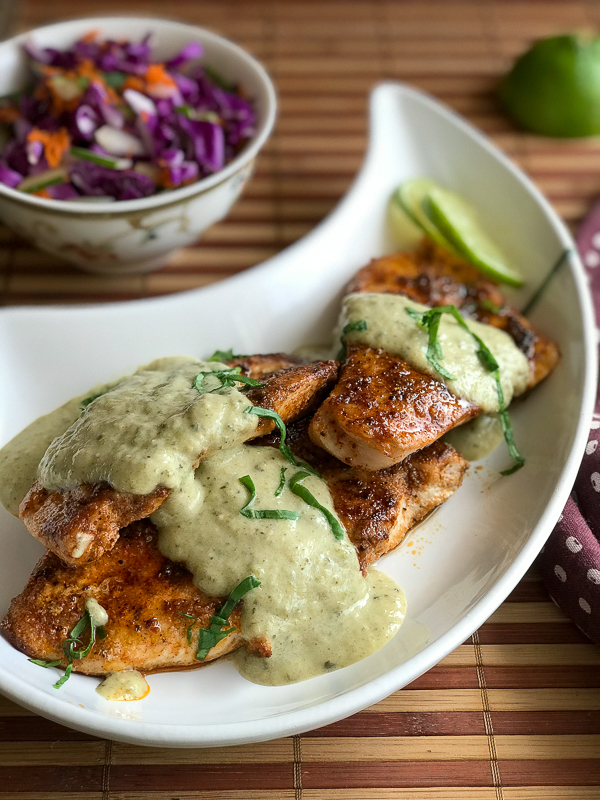 10Serve your sizzling grilled chicken with a drizzle of the Roasted Tomatillo and Key Lime Cilantro Salsa and bring a smile to your families' faces. Garnish with fresh cilantro and fresh limes as desired.